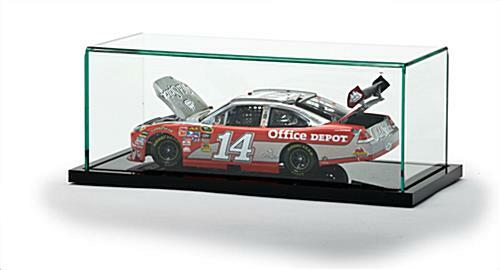 13" x 5.5" x 7"
The diecast display case is constructed from a 1/8" plexiglass, opposed to brittle styrene. Cover lifts off fast, allowing users to quickly change collectibles. 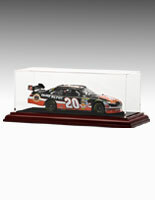 Crystal clear top gives full visibility to the collectible inside the diecast display case. The bottom section provides a neutral color so miniatures stand out. 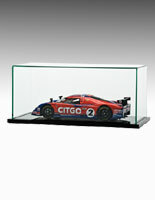 The diecast display case, also known as a plastic showcase, can accommodate custom vehicles and cars up to 10"x3"x4". A 1:24 scale nascar model works nicely within the box. There is no need to show only one piece inside these cases. This high quality diecast display case that has a black base can fit a selection of hot wheels cars. The smaller the size of the toy, the more pieces can be exhibited. 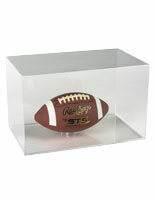 This acrylic model car box, diecast display case can be used to show sports mementos. Anything placed inside will instantly have a more prestigious look. 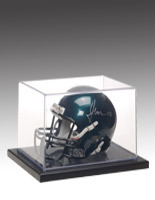 Model vehicles, nascar and other sports memorabilia are just some of the many items that these medium size boxes will hold. 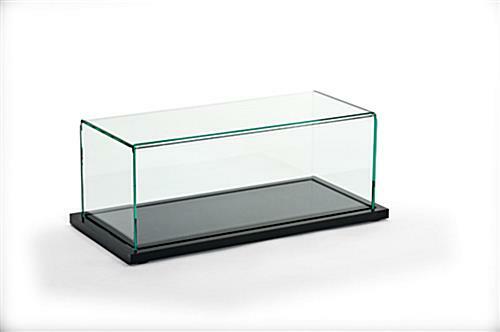 This diecast display case that is made for model cars is made with a 1/8"acrylic. These toy cases do not easily crack like most plastics used for small size model showcases. 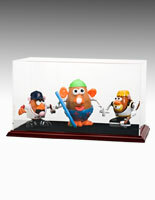 The platform of the acrylic diecast display case has a solid construction, making it harder to be moved or knocked down. Lighter show cases are more prone to movement, endangering the model vehicles within. The diecast display case protects scale toy cars from dust, yet allows them to be fully visible. Accessing a model nascar within the unit is simple by merely lifting the top off. 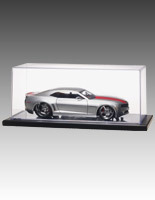 This diecast display case that is for collectibles is just the thing to appropriately exhibit and protect a selection of small size cars and vehicles. These scale nascare cases create an impressive exhibit when multiple units are grouped together on a desk or shelf. A large size selection of scale models can be transformed into a museum by using several of these acrylic cases. 11.1" x 4.5" x 5.4"
10.1" x 3.8" x 4.0"